I got this Philips GoGear MP3 player at the Singapore airport back in 2007 (Fig. 1). It cost over 60 dollars. I hated it almost immediately. The display is hard to read and has silly little bubble animations instead of plain information on its OLED display. It’s rechargeable, so you can’t just buy a AAA battery at the airport newsstand to keep it going. Its USB port is the old slow USB 1.0 speed. And it takes four hours to charge. The GoGear only holds 1 GB of music. It’s got six equalizer presets no one ever uses, and an FM radio no one ever uses. I had worked with Philips engineers on DVD players when I was at National Semiconductor. I was not impressed by their design prowess. This product did nothing to improve my opinion. Figure 1. 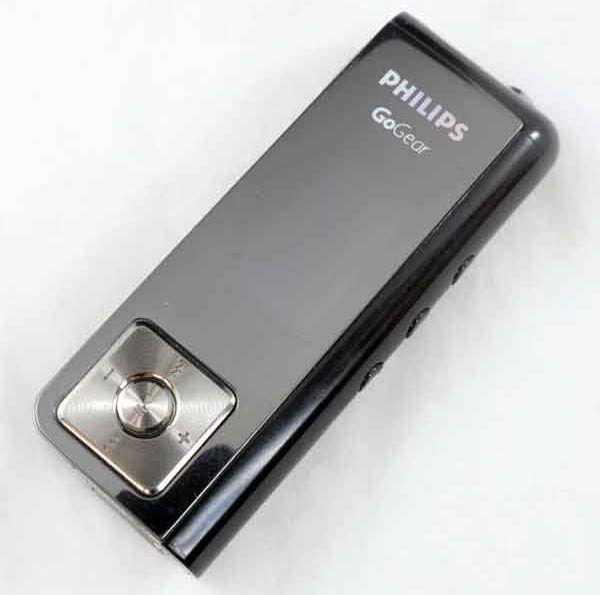 The Philips GoGear MP3 player introduced in 2007. The first problem is that the unit is glued together (Fig. 2). It makes service difficult, and you’re always afraid of breaking things. The prismatic Li-ion cell is not a common size. The failure of my unit was it would not accept or hold a charge. The flash memory still worked fine after all these years. Figure 2. The cover to the player is glued on. The cover just hides more chromed plastic (Fig. 3). It seems like a waste of money to glue a brushed plastic cover over a chromed plastic frame. Appearance was more important than function to the design team. Figure 3. The cover seems redundant since it covers more chromed plastic. Figure 4. The Li-ion battery cell has a braided metal patch for RFi interference. 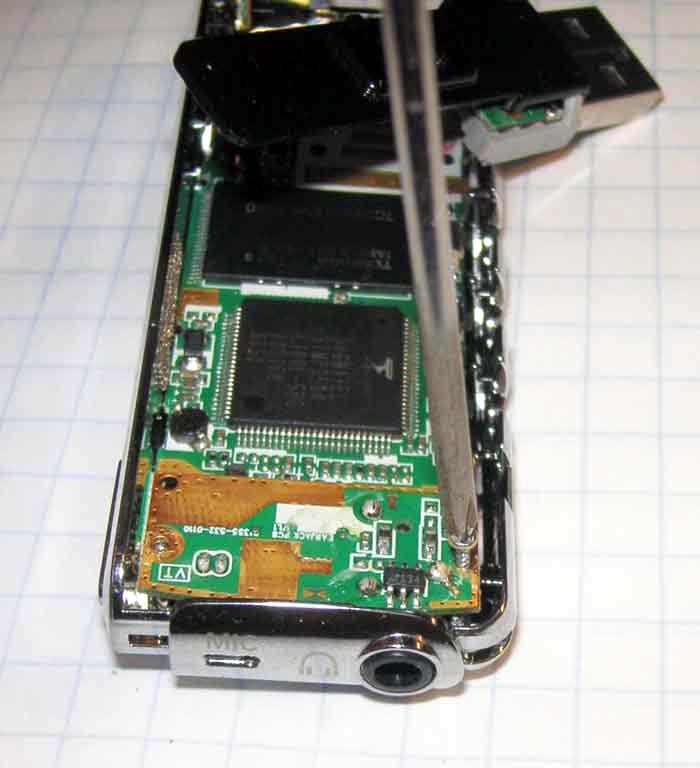 The plastic case must not have been carbon- or metal-filled for RFI (radio-frequency interference). 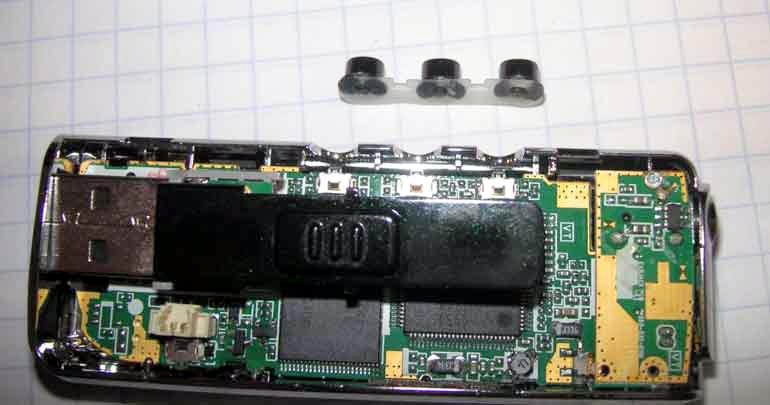 There was a little braided patch on the battery to make an RF connection to the battery cell (Fig. 4). 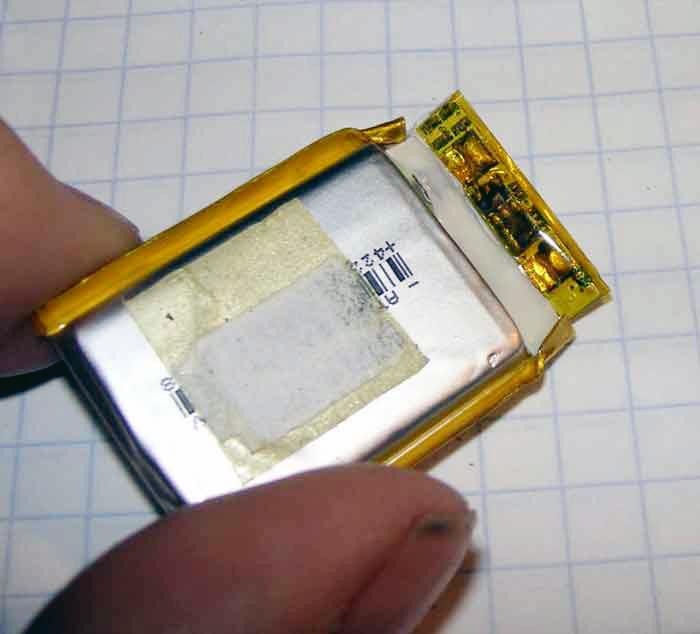 The battery cell itself seemed complex and expensive since it had chips and components to control and monitor its charging and discharging (Fig. 5). 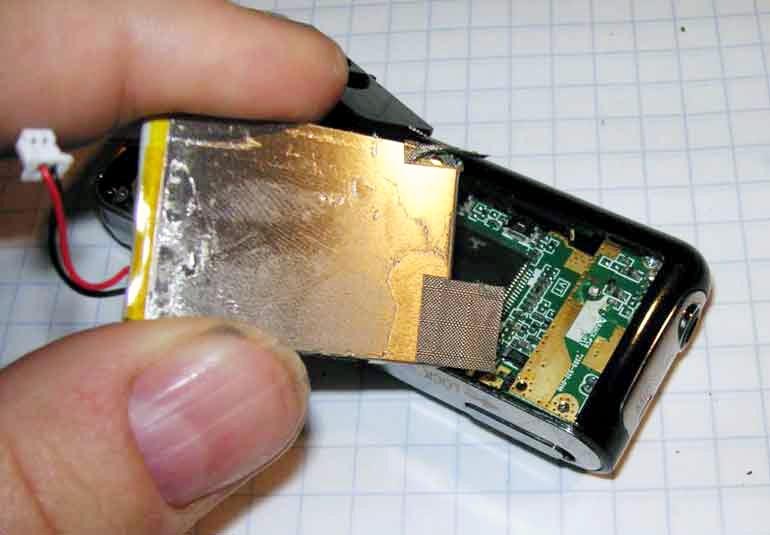 That and the Kapton tape assembly makes the whole battery needlessly expensive. and control the charge and discharge. The operating buttons (Fig. 6) were a small plastic injection molding that operated tactile switches mounted to the main PCB (printed circuit board). Using discrete purchased tact switches is far preferable to “rolling your own” like the engineers did with the Trek Sensor bicycle speedometer. The expense of the switches was compounded by the expense of the gold-immersion PCB and sliding USB plug. Figure 6. The buttons operate side-mounted tact switches on the main PCB. Adding to an already expensive design, the headphone jack was mounted on a small mezzanine PCB held on with a screw (Fig. 7). That board connects to the main PCB with an expensive board-to-board connector. It adds to assembly cost and makes testing more difficult. This is usually a sign of sending in industrial designers and stylists with no concept of high-volume, low-cost consumer product design. Figure 7. The headphone jack is mounted on a small mezzanine PCB. The plastic case is also a complex and expensive injection molding (Fig. 8). 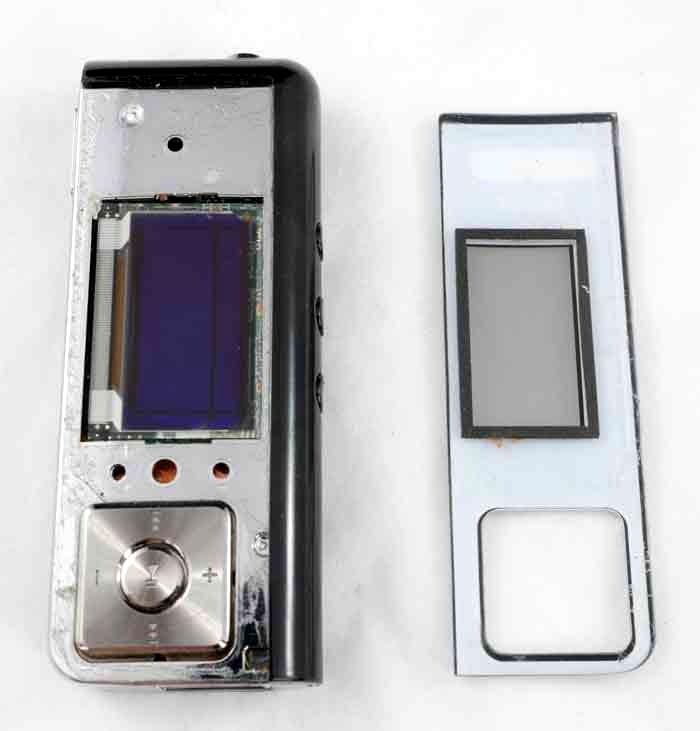 A case like this requires tooling with slides, and the chroming of the plastic is another expensive step. This isn’t some product with a 20-year design life. It was obvious in 2007 that MP3 players would only get smaller, cheaper, and have much more memory in a few years. Spending all this money on expensive components and complex assembly just doesn’t make any sense. this design costly to build. The product did have one feature I loved – a physical “hold” switch. Instead of holding down some button for three seconds, you just slide the switch and all the pushbuttons stop working. That way you can’t accidentally press any of them when the unit is in your pocket. Great stuff, but that required a little chromed plastic slide that has to be assembled into the case, and then you have to ensure it lines up as you install the PCB. despite the charging system not functioning. 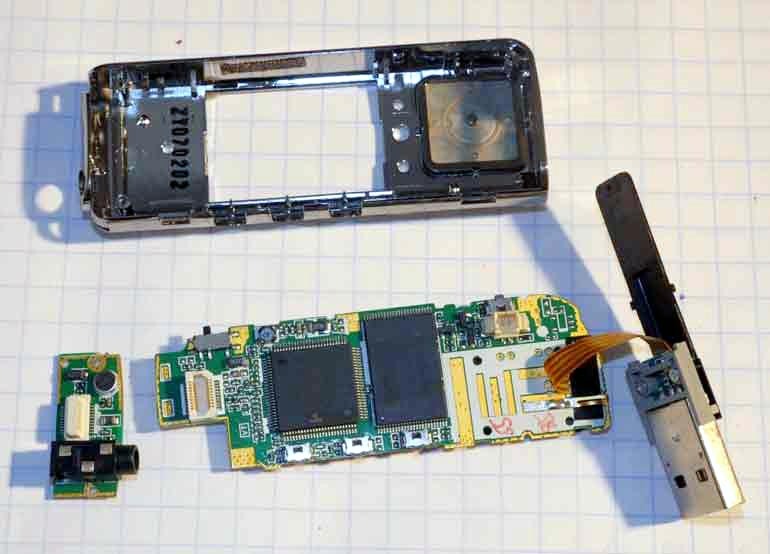 My friend Eric Schlaepfer taught me the joy of zombie electronics – that when you see if what you just took apart still works while in pieces (Fig. 9). 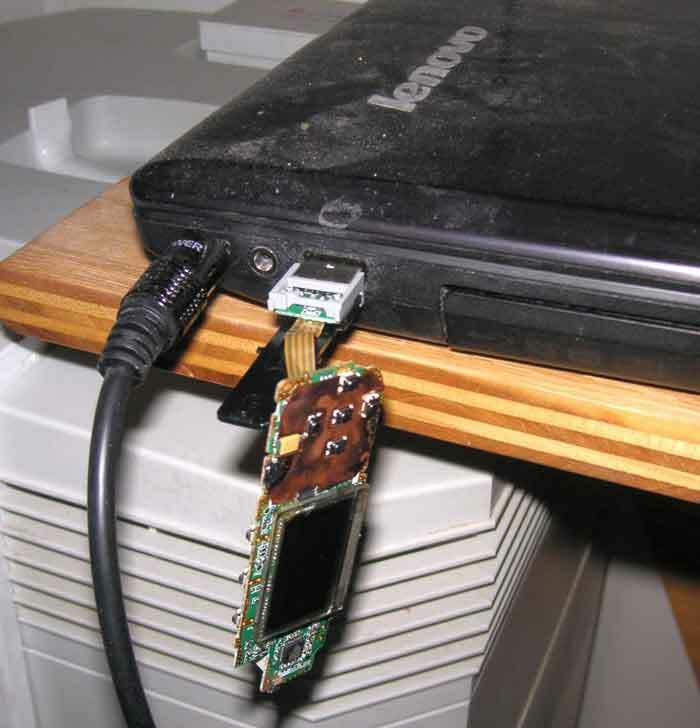 Sure enough, the flash memory and display still worked despite my hacking. Since the battery was a smart battery with active components, I knew that replacing the battery cell would be near impossible. So, this over-complex, over-designed, over-priced, already-obsolete bit of electronics went into the trash. I got a smaller player for 29 dollars on Amazon. It holds 8 GB, not 1 GB, and sounds just fine with my Etymotic headphones. I do miss that sliding hold switch, however.